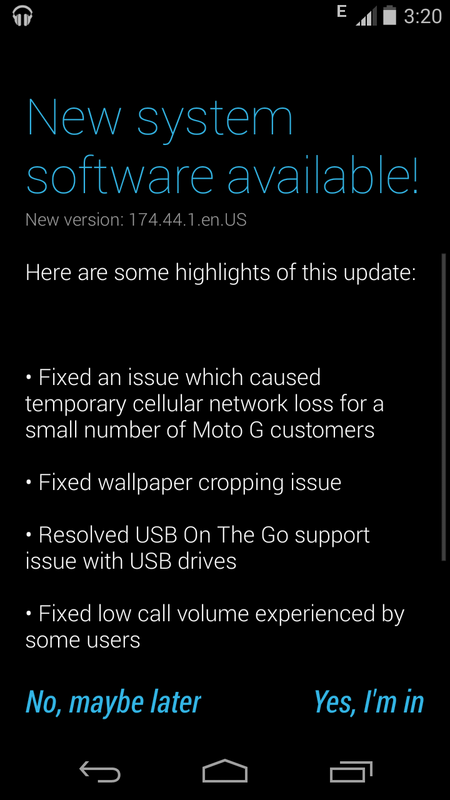 Motorola's super hit Mobile - Moto G which is released in many countries has even got the latest Android Update - KitKat and here's a new software update from Motorola for fixing USB OTG support Issue and Other issues. Resolved USB On The Go Support issue with USB drivers. Fixed low call volume experienced by some users. Motorola has justified for the cause of users agony and to the addition of that the release seems to be quite surprising on. Now the latest System version is 174.44.1.en.US (Global GSM) whereas the Older version was "172.44.4.falcon_umts.Retail.en.US." All you got to do is Navigate to About Phone - System Updates - Yes, I'm in - Download and Install.. Voila. Here's the detailed Release Notes about this new Software Update. Seems fine with OTG after the up-gradation and also other issues were fixed, If you are an Moto G user, feel free to write your views below.